Ever since the westerlies weakened nearly a week or so back South India has been pretty much seeing thunderstorms on a daily basis. Yesterday saw very heavy rains lash Hyderabad and surrounding areas resulting in water logging in many areas. Many parts of the city recorded more than 100 mm rains in couple of hours. 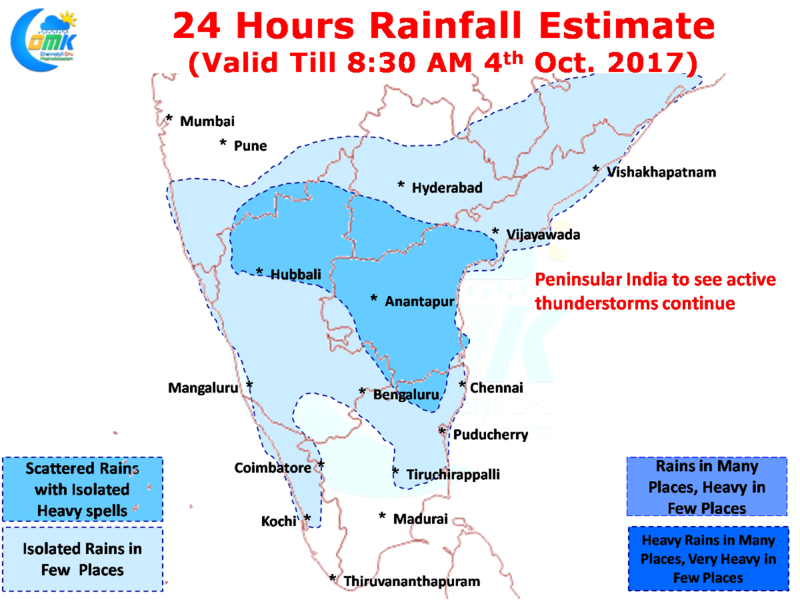 Closer home few areas of North TN also recorded moderate rains as thunderstorms lashed parts of Vellore, Kanchipuram & Tiruvannamalai district. KVK Kattupakkam south of Tambaram recorded 14 mm while Poonamallee AWS recorded 7 mm. 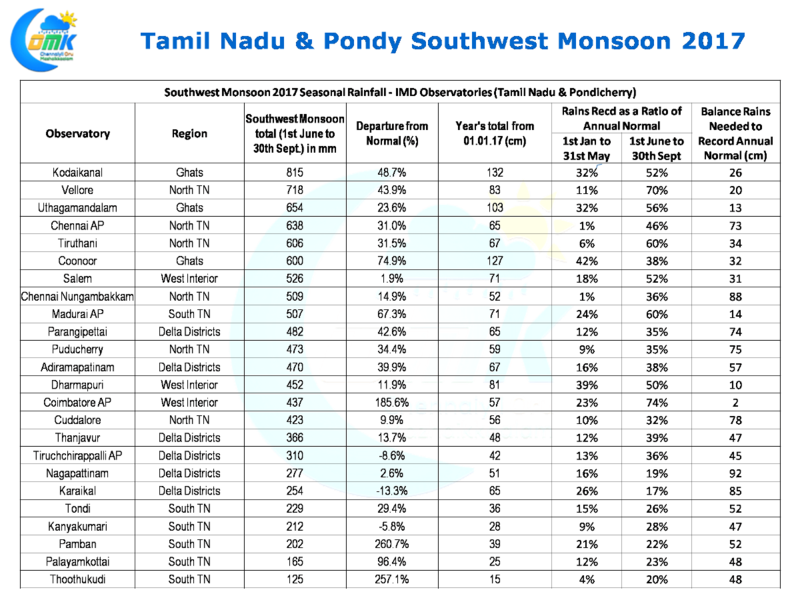 In what was one of the best Southwest Monsoon season in recent times only three IMD observatories in the state recorded below normal rains for the period 1st June to 30th Sept. Nearly 1/3rd of the observatories recorded 50% or above of the annual quota of rains during the just completed Southwest Monsoon season. The highlights being Coimbatore AP & Vellore both 70% of its annual rains during these 4 months. With 3 months still left Coimbatore AP just needs 2 cms to complete its annual rainfall. Models once again indicate an active day in terms of thunderstorms for South India with many parts of Interior Karnataka and adjoining parts of Telengana & Rayalaseema possibly in line for a good spell of late evening rains. 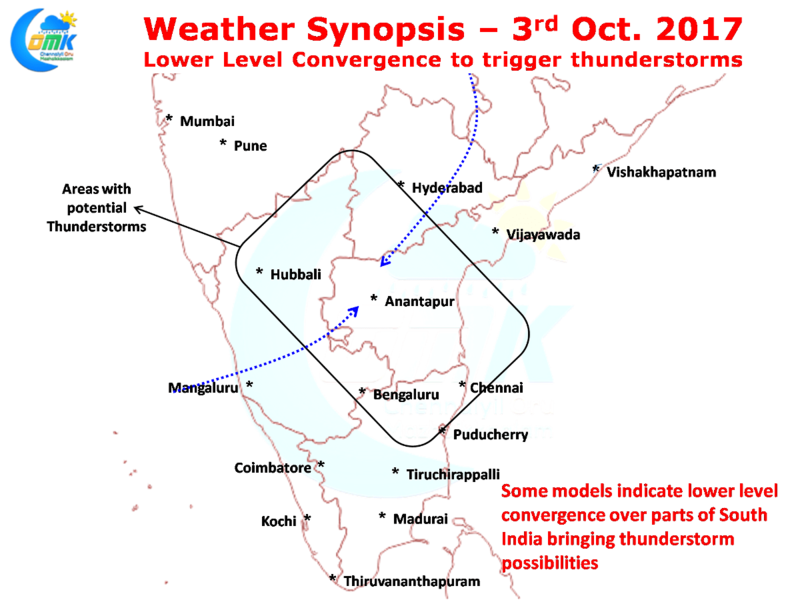 Some models indicate lower level convergence which could possibly bring isolated heavy rains to parts of North Tamil Nadu as well. The places to the west of Chennai is shown with marginally conducive conditions for the development of thunderstorms today evening. Though the weak steering winds are an issue the places which see thunderstorms develop could see moderate to heavy rains as overall atmosphere remains conducive for thunderstorms to thrive on. With some luck Chennai could see late evening / night thunderstorms as some of the interior storms cross coast.